‘My daughter and I had been planning a milestone adventure, a 30 day hike along a portion of the Appalachian trail in the year that she turns 30 and I turned 60 years old. We were really excited about the prospects and began making preparations, but then I suffered first a knee injury and then I herniated four discs in my upper back. Needless to say, it was a huge setback for us. The pain was intense. That along with the restricted movement that came along with it really jeopardized the entire idea of such an adventure and I seriously considered just canceling on the dream. 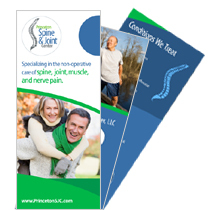 But then my wife recommended that I contact Dr. Funiciello at Princeton Spine and Joint Center. She had previously received excellent care from Dr. Funiciello for her own neck and back pain and she recommended that I contact him. Well I did, made appointment and from the moment I met him, I knew it was the right move.